The Strand Theatre gets another big turn in the state spotlight this Friday as the nation's first lady, Michele Obama, comes to Columbia Road for a campaign rally to support the Democratic gubernatorial ticket. It’s a good opportunity to let the broader community see the jewel that the Strand has once again become, thanks in large part to the last city administration under Mayor Menino that pumped in some $8 million to renovate the theatre. This is a big month for the Strand. Whatever the inconveniences, it is good to see the Strand being put to use in this way. Mayor Martin Walsh has put the Strand on the map as a venue for rallies such as this one. He held two big events at the Strand last year. 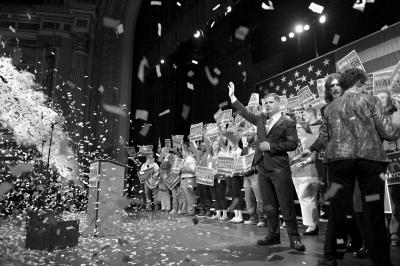 The first, in May to kick-off his candidacy, drew a big crowd. The second, on the eve of his big win last November, was even bigger and showed that a diverse audience can and will get themselves to the theatre when they have a compelling reason to go there. These are all encouraging signs for the city managers and the private producers who hope that the Strand will also become a thriving venue for the arts. In particular, the Fiddlehead Theatre Company, which is now the official resident company at the Strand, is banking on getting theatre-goers to come there with regularity over the next year. The first big test for Fiddlehead comes later this month when it stages the Elton John-infused musical “AIDA” at the Strand for a one-week run beginning on Oct. 17. Now that the theatre is equipped with state-of-the-art light and sound systems, it can support the kind of high-caliber productions like the “AIDA” show. Tickets are priced quite reasonably at $25 and up, a bargain compared to downtown theatres offering a comparable product. Getting theatre-goers to come to Dorchester, though, has always been a hurdle. It will take a collective effort to help make it happen, and that effort starts at home. We need to support the Fiddlehead season that begins with “AIDA” and continues next February and April with “The Wiz” and “Jesus Christ Superstar.” There will be other great shows in the interim, too, including the Jose Mateo Ballet Company’s “The Nutcracker” in December. For many of the Democrats who come to the Strand on Friday, it will be their first time in the theatre. Let’s hope it’s not the last. When Dorchester Dems make their pitch for their favored candidates, they should also make an extra lobbying effort for our hometown theatre— which is ready for its big break.